While flows are up year-on-year, October was a slightly leaner month for Gazprom's exports to the west. In his October 18 briefing to Russia’s prime minister Dmitry Medvedev on Gazprom’s readiness for the autumn/winter period, CEO Alexey Miller mentioned that the company was close to its maximum annual amounts under all contractual obligations. He was predicting exports of nearly 205bn m³ to Europe (including Turkey) in 2018. However, Russian flows in October were down month-on-month by 2.8% to the EU and by 19.3% to Turkey. 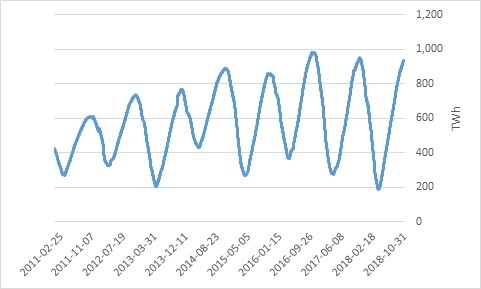 This could be explained by a surge in LNG regas as record shipping rates are making reloadings uneconomical, a warm October and the fact that gas demand in Europe is down year-on-year. With temperatures having recently dropped, we should expect some more Russian gas to flow to both the EU and Turkey. 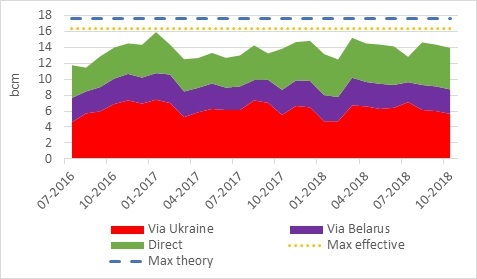 The overall monthly drop affected all routes, but once again Ukraine was the most affected at -5.7%, compared with just -0.5% for the direct routes. This shows that Gazprom is effectively using Ukraine as the swing transit route while preferring to maximise its direct routes and in particular Nord Stream 1. 2018 could end up with EU gas demand down year-on-year and Gazprom exports reaching a record high level. And this is mainly because of the need to refill storages that had been severely depleted last winter. However, today storage level remains 14 TWh (c. 1bn m³) less than the maximum level reached last year. Stay tuned for the winter impact! http://www.gazprom.com/press/news/2018/october/article464466/; see also NGW report here. Latest JODI gas data shows that in Jan-August 2018 gas demand was down 1.5% vs same period last year.